On 3rd July, IBM Subject Expert, Dr Trevor Davis, gave Scholars his thoughts on leadership and creativity, during a talk organized by Eduardo Duarte Zanelato, studying on the Masters in Innovation, Creativity and Leadership (MICL) programme. 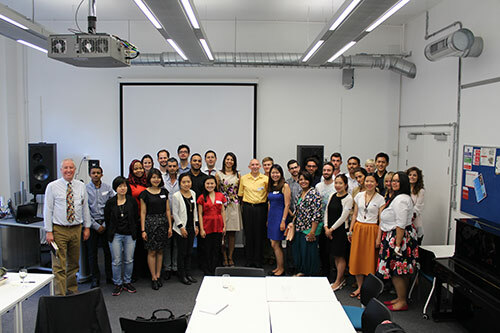 On 3rd July, Dr Trevor Davis, IBM Subject Expert and consumer industry futurist, addressed Chevening Scholars studying at universities across the UK including 14 studying at City University London. The event, held in Room AG02 in the College Building, was organized by Chevening Scholar Eduardo Duarte Zanelato, studying for a Masters in Innovation, Creativity and Leadership at City's Centre for Creativity in Professional Practice. The Chevening Scholarship is an international scholarship scheme available to 144 countries and territories, which enables students with leadership qualities to undertake postgraduate study or courses in the UK. The scheme is funded by the Foreign and Commonwealth Office. Dr Davis, who spoke about the relationship between creativity and leadership, is also a distinguished engineer and member of the IBM Industry Academy. He identified the Chevening Scholars as representing "the next generation of leaders that propel business and society forward through innovation". To Dr Davis, "engaging with university students is essential if you value fresh and innovative thinking". He also expressed the view that that IBM treasures 'wild ducks' or original thinkers who are a little wilder than the average, and that "meeting scholars from around the world allows me to pass that positive message on and to hear new and diverse voices." "Each year, we want to make the Chevening experience a fantastic one for our Scholars by organising a programme of activities for them. We particularly want to encourage leadership and proactivity and one such project gives Scholars the opportunity to apply for funding to run their own events at their host university. City is very popular with our Scholars, with around 14 Scholars studying there this year. We look forward to running further events in partnership with City in the future." "The Chevening scheme selects potential future leaders in their respective fields worldwide and I think our generation is challenged by the way businesses work and in leadership-followership dynamics. Having Dr. Davis share his insights into how to leverage creativity across organisations was one of the most valuable experiences for us this year in London. I hope this talk will positively impact the way we deal with real life situations from now on. It's been an honor to help organise the event and I hope we all can benefit from what we learned." "We have been delighted to welcome Chevening Scholars onto the Masters in Innovation Creativity and Leadership at City University for the last two years and we were therefore very pleased to act as hosts for this event. We very much look forward to hearing, in years to come, how those who benefit from this excellent scholarship programme are able to apply what they have learnt both from this event, and from their studies in general." Please visit this website for further information on the Chevening scheme.